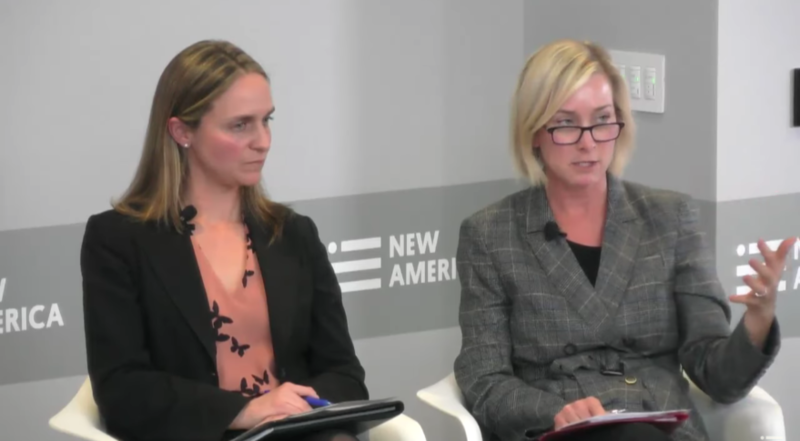 Colleen King, Charter Communications’ vice president of regulatory affairs (left) and Staci Pies, Google’s senior policy counsel (right) said the FCC should auction C-band instead of adopting the C-Band Alliance plan. Credit: New America webcast. WASHINGTON — Letting satellite operators dictate how C-band spectrum is shared with other communications companies will inevitably result in litigation, Google and Charter Communications warned Feb. 5. Officials from the two companies said the warning was not an indication that their companies would initiate the legal sparring, but that the number of competing interests for the spectrum all but guarantee lawsuits will tie up the U.S. Federal Communications Commission’s proceeding. Pies and Colleen King, Charter Communications’ vice president of regulatory affairs, urged an auction of C-band — spectrum used mainly for satellite television broadcasts — as the best way to open up the band to users outside of the satellite industry. “We really think that if the FCC prioritizes an auction using all the resources they have, they can complete an auction in 12 to 18 months and get 5G deployed in 36 months,” King said. That time frame mirrors how long the C-band Alliance — a group formed last year by satellite operators Intelsat, SES, Eutelsat and Telesat — estimate their plan will take to free 200 megahertz of C-band for 5G. The C-Band Alliance has warned that government-led reassigning of C-band would likely trigger legal disputes that would slow 5G network deployments. Satellite operators have access to 500 megahertz of C-band in the United States, but insist 200 megahertz (including a 20 megahertz guard band to prevent signal interference) is the maximum they can do without. The FCC has yet to decide on how much C-band to open up. Prior to the partial government shutdown that idled most federal agencies including the FCC for five weeks, a decision was anticipated between April and June. Ross Lieberman, senior vice president of government affairs for the American Cable Association (ACA), a group with members who rely on satellite C-band broadcasts to receive content, said the full 500 megahertz appears to be worth up to $60 billion to wireless carriers, making a strong incentive for the C-Band Alliance to push their plan and gain a huge windfall. Lieberman said the ACA is also starting to turn against the C-Band Alliance plan over concerns about how to define the “harms” cable operators will incur from the reduction in satellite C-band. Those concerns have landed on deaf ears at the C-Band Alliance despite raising the subject numerous times, he said. “As a party that seeks to profit fully from the sale of the spectrum, we don’t think that they are in the best position to be able to decide for users what is a harm and how to address it,” he said. The C-Band Alliance proposal lets satellite operators determine how cable companies are impacted by the loss of spectrum and consequently how remediation would play out, he said. Unless the C-Band Alliance modifies its proposal, Lieberman said the ACA may seek the FCC’s involvement as an arbiter. Padden said the C-Band Alliance has had numerous discussions with the ACA that should have alleviated their concerns. Lieberman denied the ACA made such demands. “We never said that,” he said. The C-Band Alliance plan involves using proceeds from selling C-band to cover the cost of eight new satellites — four for Intelsat and four for SES — to replace lost capacity. Eutelsat and Telesat would use capacity on those satellites. The satellite operators would also install filters on satellite dishes to prevent interference. Padden said the C-Band Alliance sent out 400 letters to prospective spectrum buyers, and met extensively with Charter officials. Despite indicating interest in the C-Band Alliance plan in those meetings, Charter is still lobbying against it, he said. King said Charter’s ultimate goal is to be involved in 5G, meaning it will keep options on the table while pushing for a spectrum auction.